Slowly but surely inflation catches up with you. 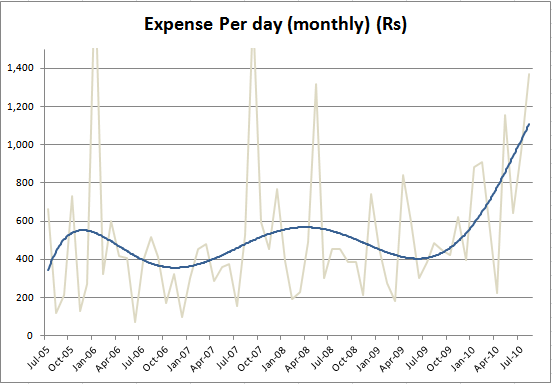 At the start of 2010, I had posted my per-day expenses in Bengaluru. Few friends pointed out that recent surge in inflation seems to have had no impact on me. Sadly, that's not true, as the chart posted earlier was merely 'Cumulative Average'. If we are to look at the moving average, the true picture emerges. One cannot simply pump Rs. 1.1 million crores ($235b, FY11 GOI budget) in the economy without having major side effects. This spending spree has single-handedly reduced the value of our savings by ~10-15%. My cumulative per day expense is currently at Rs. 512 ($11, for 62 months, excludes investments). However inflation has finally caught up and it will take some miracle to keep my expenses below Rs. 1000 ($21) per day for FY11. I have updated the breakup chart. The previous chart had mistakes in tax numbers. 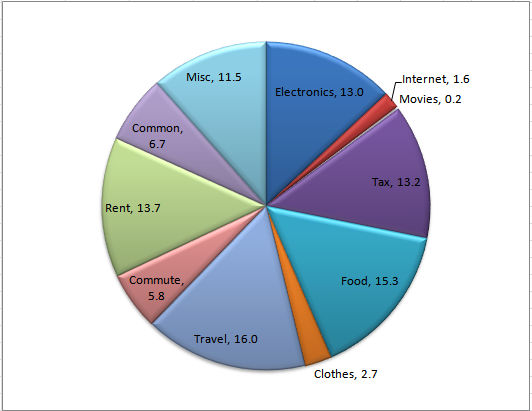 p.s -- Example -- My per day expense on food, cumulative average has been 15.3% of Rs. 512 = ~Rs. 77 (Rs. 25 Lunch, Rs. 12 breakfast, Rs. 25 dinner and Rs. 15 misc). But for FY11 this number has roughly jumped to Rs. 150 per day!